What’s That Thing On Her Head? I know, I know. I like to start the week off with a recipe, but I don’t have one. Mea culpa. I plan on getting into the kitchen later to do some cooking so I can share it all with you, but it was a weird weekend and when I did cook, I didn’t have the luxury of time to take photographs. Which is a little bit of a drag, but, silver lining! I’ll be forced to make yummy food all over again. Hey…what’s that thing on her head? In case you’re staring at this ad in stricken disbelief–which is totally understandable–I will explain. This is an ad for stores that sell jewelry. A jewelry mall, if you will. Glamorous, high-end jewelry, not the “Buy three pairs of earrings, get the fourth free” kind that I usually buy. And the model, in her LBD and thick golden rope of a necklace, is wearing a cat on her head. A cat. On her head. Here’s a closeup. Shmexy. Hey, wait. Is that terror I see lurking in her eyes? Indeed, this is certainly all I’ve imagined and more. I know that when I think about which lovely lady ought to get the fancy jewelry, it’s almost always the one wearing an animal on her head. Only opposite. “Give in to the luxury”, the ad says. 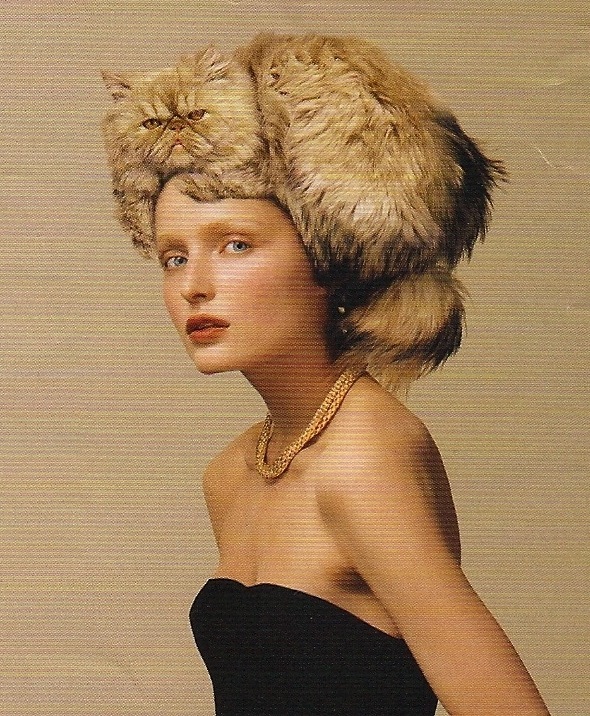 But how does wearing a cat on one’s head indicate “luxury”? Or something that should be given in to? I fight the urge to accessorize with my cat every day, and I feel like I’m a better person for it. Because if she were wearing pajamas–and you know I’m right here, people–she would be a crazy cat lady. This should be instant birth control. Instead, this ad was meant to create allure. Herein lies my befuddlement. I don’t understand. I mean, if I want to buy shoes I don’t look for someone with an egret perched on her head so I can think, “Oh, wow, that must be a great shoe store I can’t wait to shop there.” Maybe I just don’t grok high-end jewelry in this way, but…why is this lady wearing a cat on her head? And what does that say about…oh, good Lord, about any and everything that’s weird about the advertising business? Please, internets, if you can explain, I would be most grateful. 9 responses to What’s That Thing On Her Head? And you’re a lady of distinction, Mrs. C. I’m so glad this escapes you. 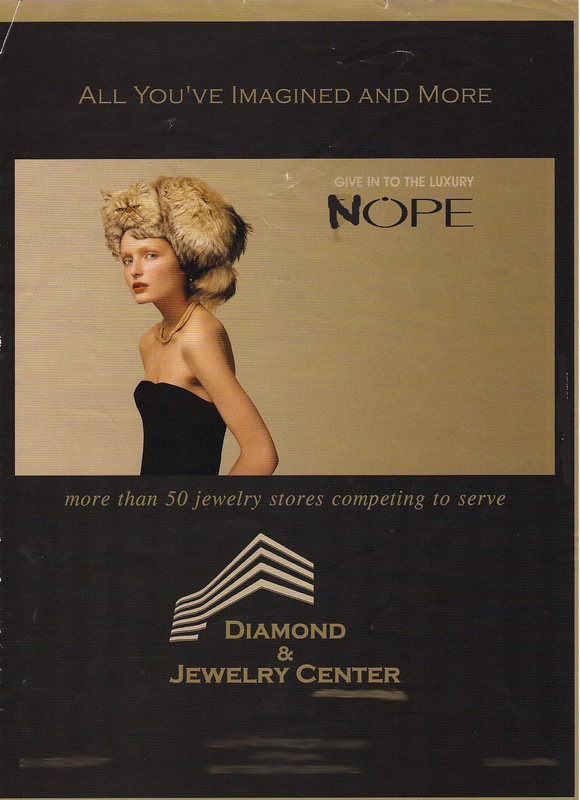 I will take a stab at this, based on the NOPE in the ad…..could it be don’t wear furs – spend your money on jewelry instead. Other than that – I give up! Mom, you’re adorable. The “N” in Nope was written in by me; it was actually the name of a jewelry maker that I altered. So the “Nope” is actually me saying, I don’t get it. LOL It’s a mystery! I think it’s supposed to be…Surrealism. Maybe. Like when ladies wore hats in the shape of shoes or lobsters. That kind of thing. So it’s a cat fascinator hat? Crazy. Haha! It can’t be any more rude than trying to sell jewelry with a cat on your head. Or is my assumption about jewelry sales impawsible?